Vault Tellers work in banks and are responsible for looking after the operations of the bank’s vault. The major job description listed on the Vault Teller Resume include –opening the vaults, recording accurate details of currency, counting cash and checking the stored valuables, recording deposits in customers account, obtaining and transferring currency, updating registers, checking deposit slips, processing money transfers, preparing shipment, processing orders and executing all other associated duties. 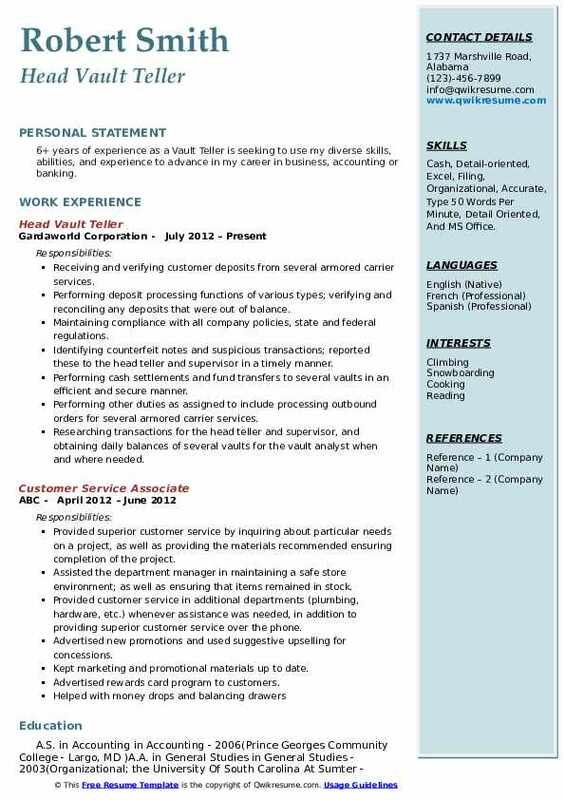 A well-drafted resume for this position lists skills and qualifications such as – cash-handling expertise, attention to details, sharp counting skills, computer literacy, integrity, resilience, and strong communication skill. 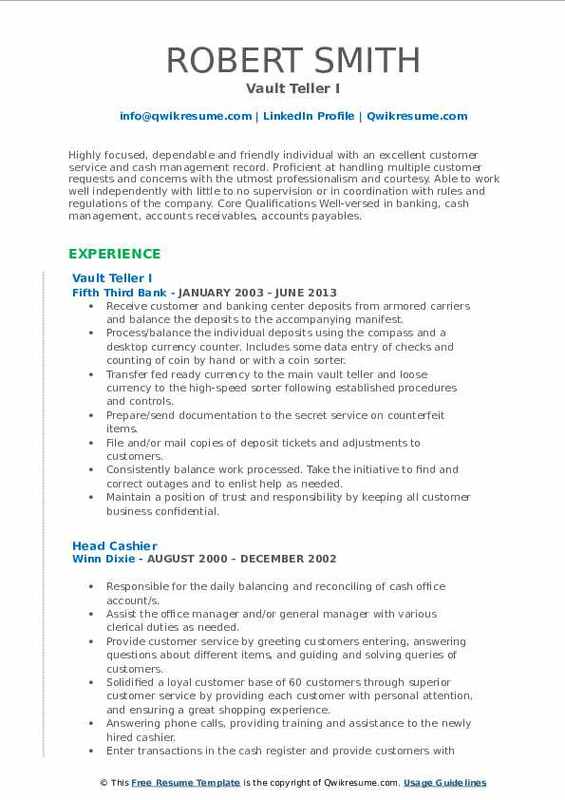 This career undoubtedly requires the candidate to be meticulous, honest, with smooth cash handling abilities. Advanced education is not always compulsory, though most of the employers want to see at least a Bachelor’s degree in Finance or Accounting on the eligible resumes. Headline : 5+ years of experience as a Vault Teller is seeking to obtain a secure career emphasizing professional achievement and growth. Skills : Special Dedicated Customer Service Team Member, Respected Builder, And Leader Of Customer-focused Teams, And Knowledge Of Microsoft Office Suite 2007. Entering customers transactions into computers to record transactions and issue computer-generated receipts. Examining checks for endorsements and to verify other information such as dates, bank names, identification of the persons receiving payments and the legality of the documents. Counting currency, coins, and checks received, by hand or using a currency-counting machine, to prepare them for deposit or shipment to branch banks or the federal reserve bank. Compiling with REG E, BSA, OFAC, and CIP requirements such as checking names against OFAC for cashing checks, and for issuing cashier checks and/or money orders. Recording transaction information on forms or logs, and notify designated personnel of discrepancies. Receiving and counting daily inventories of cash, drafts, and travelers' checks. Carrying out special services for customers, such as ordering bank cards and checks. 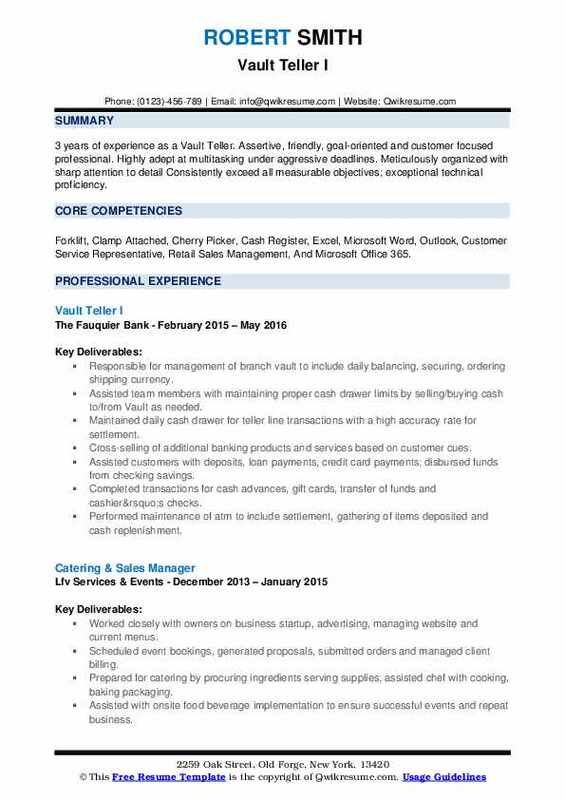 Objective : 3 years of experience as a Vault Teller. Assertive, friendly, goal-oriented and customer focused professional. Highly adept at multitasking under aggressive deadlines. Meticulously organized with sharp attention to detail Consistently exceed all measurable objectives; exceptional technical proficiency. 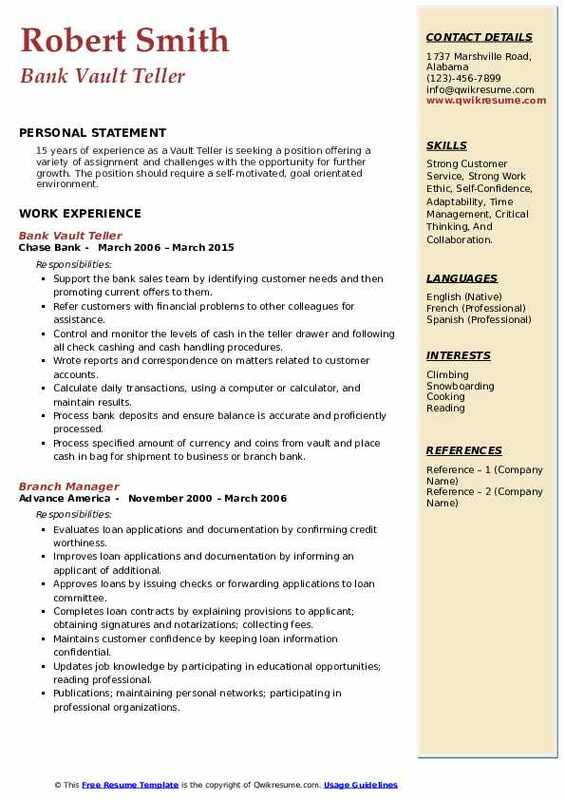 Skills : Forklift, Clamp Attached, Cherry Picker, Cash Register, Excel, Microsoft Word, Outlook, Customer Service Representative, Retail Sales Management, And Microsoft Office 365. Responsible for management of branch vault to include daily balancing, securing, ordering shipping currency. Assisted team members with maintaining proper cash drawer limits by selling/buying cash to/from Vault as needed. Maintained daily cash drawer for teller line transactions with a high accuracy rate for settlement. Cross-selling of additional banking products and services based on customer cues. Assisted customers with deposits, loan payments, credit card payments; disbursed funds from checking savings. Completed transactions for cash advances, gift cards, transfer of funds and cashier’s checks. Performed maintenance of atm to include settlement, gathering of items deposited and cash replenishment. Objective : 5+ years of experience as a Vault Teacher. A dedicated experienced professional who excels at prioritizing and completing multiple tasks in a fast paced environment. Highly effective in organizing and creating efficient systems committed to delivering high-quality results with little or no supervision. Energetic, an insightful leader with excellent interpersonal, analytical and communication skills. 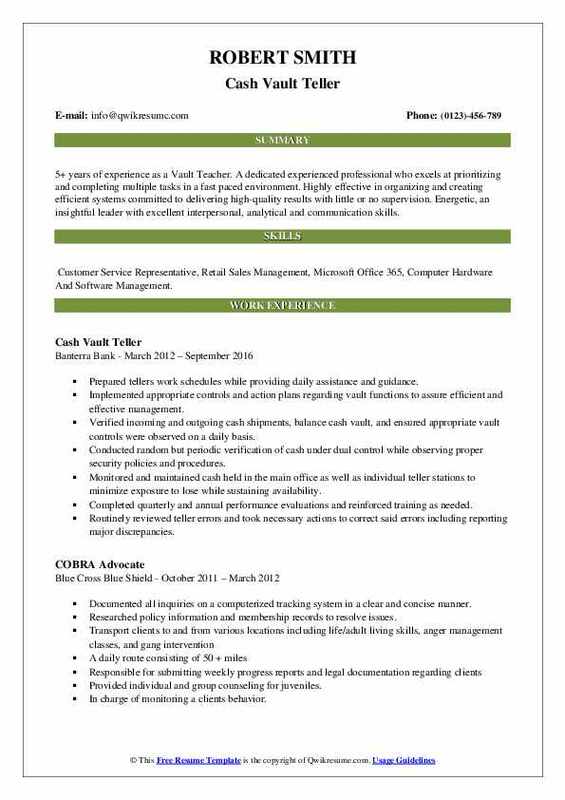 Skills : Customer Service Representative, Retail Sales Management, Microsoft Office 365, Computer Hardware And Software Management. Prepared tellers work schedules while providing daily assistance and guidance. Implemented appropriate controls and action plans regarding vault functions to assure efficient and effective management. Verified incoming and outgoing cash shipments, balance cash vault, and ensured appropriate vault controls were observed on a daily basis. Conducted random but periodic verification of cash under dual control while observing proper security policies and procedures. Monitored and maintained cash held in the main office as well as individual teller stations to minimize exposure to lose while sustaining availability. Completed quarterly and annual performance evaluations and reinforced training as needed. Routinely reviewed teller errors and took necessary actions to correct said errors including reporting major discrepancies. Summary : Highly focused, dependable and friendly individual with an excellent customer service and cash management record. Proficient at handling multiple customer requests and concerns with the utmost professionalism and courtesy. Able to work well independently with little to no supervision or in coordination with rules and regulations of the company. Core Qualifications Well-versed in banking, cash management, accounts receivables, accounts payables. 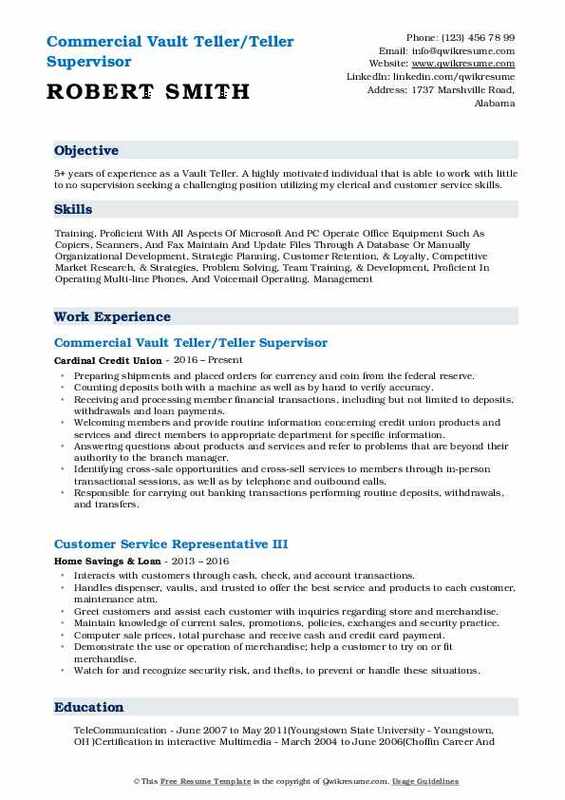 Skills : Scheduling, Payroll Budgeting, Customer Service, Time Management, Visual Merchandising, And Cash Handling. Receive customer and banking center deposits from armored carriers and balance the deposits to the accompanying manifest. Process/balance the individual deposits using the compass and a desktop currency counter. Includes some data entry of checks and counting of coin by hand or with a coin sorter. Transfer fed ready currency to the main vault teller and loose currency to the high-speed sorter following established procedures and controls. Prepare/send documentation to the secret service on counterfeit items. File and/or mail copies of deposit tickets and adjustments to customers. Consistently balance work processed. Take the initiative to find and correct outages and to enlist help as needed. 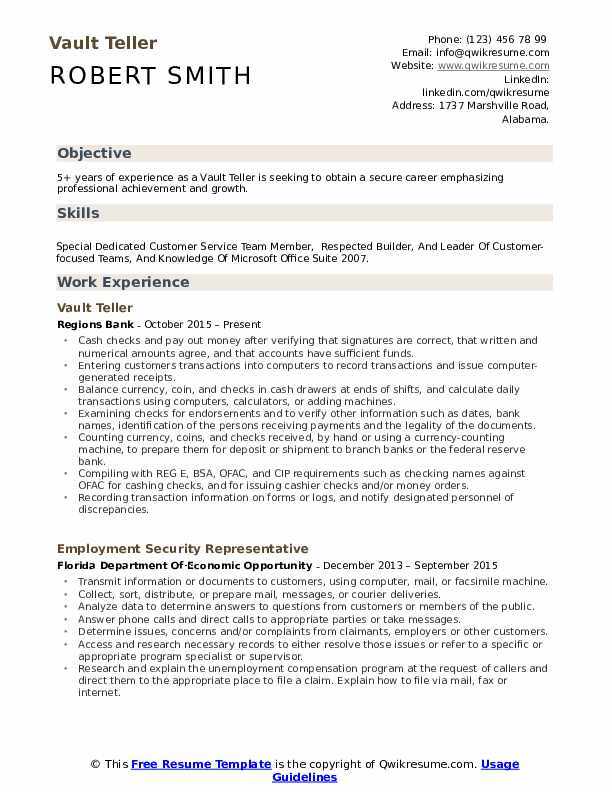 Headline : 6+ years of experience as a Vault Teller is seeking to use my diverse skills, abilities, and experience to advance in my career in business, accounting or banking. Skills : Cash, Detail-oriented, Excel, Filing, Organizational, Accurate, Type 50 Words Per Minute, Detail Oriented, And MS Office. Receiving and verifying customer deposits from several armored carrier services. Performing deposit processing functions of various types; verifying and reconciling any deposits that were out of balance. Maintaining compliance with all company policies, state and federal regulations. Identifying counterfeit notes and suspicious transactions; reported these to the head teller and supervisor in a timely manner. Performing cash settlements and fund transfers to several vaults in an efficient and secure manner. Performing other duties as assigned to include processing outbound orders for several armored carrier services. Researching transactions for the head teller and supervisor, and obtaining daily balances of several vaults for the vault analyst when and where needed. Headline : 5+ years of experience as a Vault Teller. 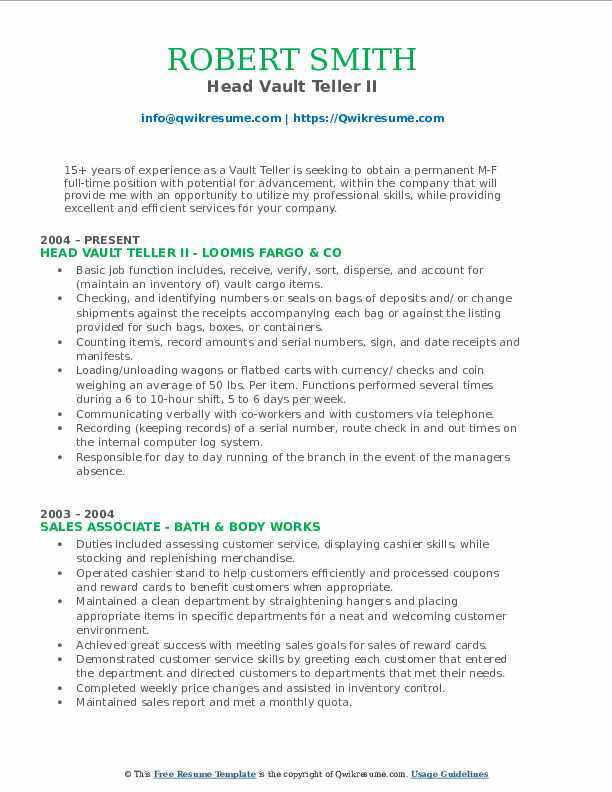 A highly motivated individual that is able to work with little to no supervision seeking a challenging position utilizing my clerical and customer service skills. Preparing shipments and placed orders for currency and coin from the federal reserve. Counting deposits both with a machine as well as by hand to verify accuracy. Receiving and processing member financial transactions, including but not limited to deposits, withdrawals and loan payments. Welcoming members and provide routine information concerning credit union products and services and direct members to appropriate department for specific information. Answering questions about products and services and refer to problems that are beyond their authority to the branch manager. Identifying cross-sale opportunities and cross-sell services to members through in-person transactional sessions, as well as by telephone and outbound calls. Responsible for carrying out banking transactions performing routine deposits, withdrawals, and transfers. 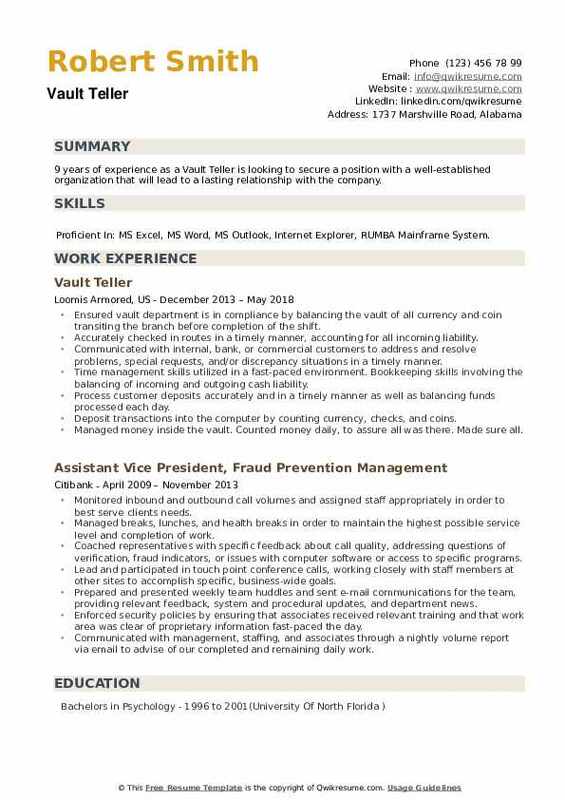 Summary : 15+ years of experience as a Vault Teller is seeking to obtain a permanent M-F full-time position with potential for advancement, within the company that will provide me with an opportunity to utilize my professional skills, while providing excellent and efficient services for your company. Skills : Competent In Microsoft Word, Microsoft PowerPoint, Microsoft Excel, Microsoft Windows 95, Microsoft Windows 98, Microsoft Windows XP, Emulator Software, Edge Software, Barcode Scanner And 10 Touch Key Boarding. Basic job function includes, receive, verify, sort, disperse, and account for (maintain an inventory of) vault cargo items. Checking, and identifying numbers or seals on bags of deposits and/ or change shipments against the receipts accompanying each bag or against the listing provided for such bags, boxes, or containers. Counting items, record amounts and serial numbers, sign, and date receipts and manifests. Loading/unloading wagons or flatbed carts with currency/ checks and coin weighing an average of 50 lbs. Per item. Functions performed several times during a 6 to 10-hour shift, 5 to 6 days per week. Communicating verbally with co-workers and with customers via telephone. Recording (keeping records) of a serial number, route check in and out times on the internal computer log system. Responsible for day to day running of the branch in the event of the managers' absence. 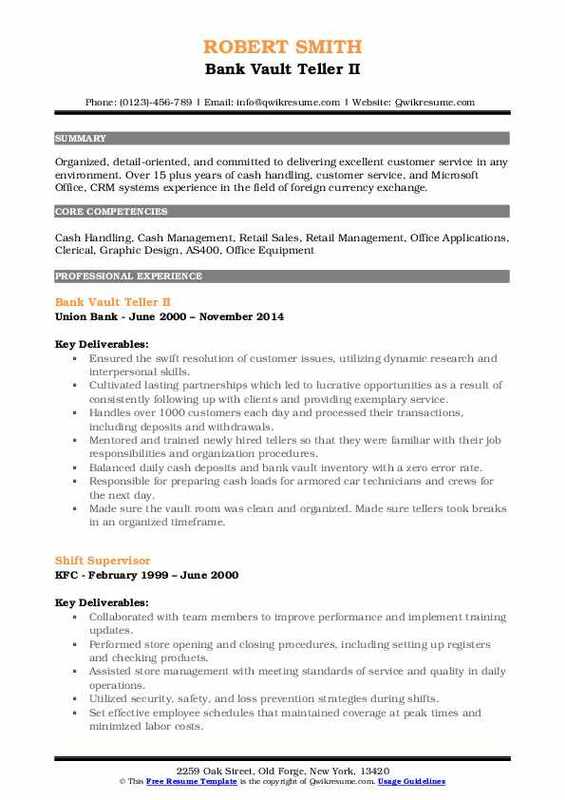 Summary : Organized, detail-oriented, and committed to delivering excellent customer service in any environment. Over 15 plus years of cash handling, customer service, and Microsoft Office, CRM systems experience in the field of foreign currency exchange. Ensured the swift resolution of customer issues, utilizing dynamic research and interpersonal skills. Cultivated lasting partnerships which led to lucrative opportunities as a result of consistently following up with clients and providing exemplary service. Handles over 1000 customers each day and processed their transactions, including deposits and withdrawals. Mentored and trained newly hired tellers so that they were familiar with their job responsibilities and organization procedures. Responsible for preparing cash loads for armored car technicians and crews for the next day. Made sure the vault room was clean and organized. Made sure tellers took breaks in an organized timeframe. Summary : 15 years of experience as a Vault Teller is seeking a position offering a variety of assignment and challenges with the opportunity for further growth. The position should require a self-motivated, goal orientated environment. Skills : Strong Customer Service, Strong Work Ethic, Self-Confidence, Adaptability, Time Management, Critical Thinking, And Collaboration. Support the bank sales team by identifying customer needs and then promoting current offers to them. Refer customers with financial problems to other colleagues for assistance. Control and monitor the levels of cash in the teller drawer and following all check cashing and cash handling procedures. Wrote reports and correspondence on matters related to customer accounts. Calculate daily transactions, using a computer or calculator, and maintain results. Process bank deposits and ensure balance is accurate and proficiently processed. Process specified amount of currency and coins from vault and place cash in bag for shipment to business or branch bank. Process currency and checks, using a computer or calculator, to verify amount on deposit slip or other forms. Summary : 9 years of experience as a Vault Teller is looking to secure a position with a well-established organization that will lead to a lasting relationship with the company. Skills : Proficient In: MS Excel, MS Word, MS Outlook, Internet Explorer, RUMBA Mainframe System. Ensured vault department is in compliance by balancing the vault of all currency and coin transiting the branch before completion of the shift. Accurately checked in routes in a timely manner, accounting for all incoming liability. Communicated with internal, bank, or commercial customers to address and resolve problems, special requests, and/or discrepancy situations in a timely manner. Time management skills utilized in a fast-paced environment. Bookkeeping skills involving the balancing of incoming and outgoing cash liability. Process customer deposits accurately and in a timely manner as well as balancing funds processed each day. Deposit transactions into the computer by counting currency, checks, and coins. Managed money inside the vault. Counted money daily, to assure all was there. Made sure all.